Laura and Juan win ‘Wedding on The BLVD’! Laura Martinez and Juan Calderon, both 29, were all smiles Wednesday morning at a press conference to announce the “Wedding on The BLVD” contest winners. 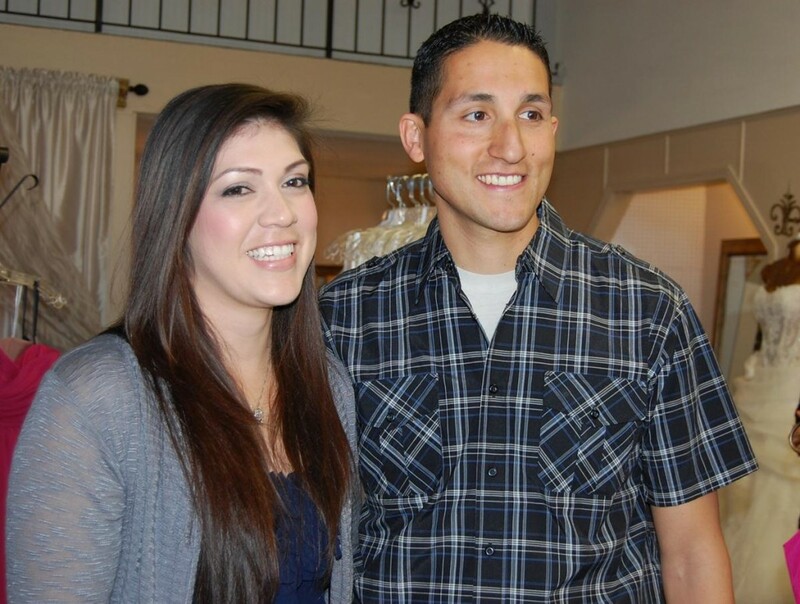 LANCASTER – Palmdale residents Laura Martinez and Juan Calderon will have their dream “Wedding on The BLVD”! At a press conference Wednesday (Feb. 13), The BLVD Association announced that the lucky couple won the first-ever “Wedding on The BLVD” contest, which provides a free wedding for up to 50 guests in downtown Lancaster. The two have been inseparable since meeting three years ago. Laura and Juan, along with nearly two dozen engaged couples, entered the “Wedding on The BLVD” contest by attending the 9th Annual Bridal Show in January at the Antelope Valley Fairgrounds. To enter, couples had to visit the BLVD Association booth to film a video contest entry and let their personalities shine through in the video. Laura and Juan described how they met three years ago when Laura was working as a manager at a fast-food restaurant. Juan, a deputy sheriff, introduced himself to Laura at her aunt’s behest. Laura gave him her number and was surprised to hear from him the next day, as soon as he had completed his 16-hour double shift. The two have been inseparable ever since, and say they are deeply in love. A committee from The BLVD Association narrowed the 24 contest submissions down to five finalists. (Read more here.) Members of the local media selected Laura and Juan from the finalists. Lancaster council member Sandra Johnson was on hand to congratulate the winning couple. At the press conference Wednesday, Lancaster council member Sandra Johnson gushed over the winning couple. Laura and Juan will be married in a ceremony on The BLVD in June. 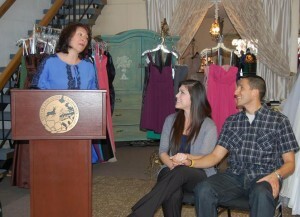 The various aspects of their complimentary wedding package are being donated by the merchants of The BLVD Association. For each item, the sponsoring merchant will work with the couple to select three options – for example, three wedding gowns, three styles of invitations, etc. Each week, the public will have the opportunity to view the three choices and vote for their favorite at www.theblvdwedding.com. These online votes will decide which item will ultimately be included in the couple’s wedding. “We are very proud to have a wedding where we can share it with the community, we’re very thankful,” Juan added. To watch Juan and Laura’s wedding planning progress and to vote each week on items for their wedding, visit www.theblvdwedding.com. For more information regarding The BLVD, visit www.theblvdlancaster.com. 6 comments for "Laura and Juan win ‘Wedding on The BLVD’!" What a blessing Laura, I know the family is very excited for the both of you. Congratulations!!!!!! Prayers do work!!! Hey, this Great! Congratulations to Juan and Laura. I AM THRILLED THEY HAVE WON A WEDDING. WHAT A WONDERFUL EVENT TO BRING TO THE ANTELOPE VALLEY. WE SEE SO MUCH OF THESE THINGS GOING ON IN OTHER STATES, WHAT A GREAT WAY TO KEEP THINGS LOCAL IN OUR OWN COMMUNITY AND USE OUR OWN SMALL BUSINESSES. CONGRATS TO THE LUCKY COUPLE!! !